In this tutorial we will see how we can call a private function of another class. So lets take an example (not so serious example this time). Say we have a class called SpiderMan that has private variable name and one private method called getMyName that will accept one String variable (this is basically to show how to pass arguments while calling such function) and it will return value of private variable name. So following is our class. Now lets have another class called GreenGoblic that wants to identify what to find who is SpiderMan so it will use reflection API. It will first get Class object for SpiderMan class and then get instance of Method class by using getDeclaredMethod function on this Class object. Second argument of this function will be argument that we will pass to the function. This will take care of function over loading. Once we have access to this Method class we will invoke function invoke on this instance. We can pass list of objects that we want to pass to function that we want to execute. So following will be our class. User will be able to search for employees based on employee id, first name or last name. Once list is displayed user can select single record and update the same. Once the record is updated flow will go back to search screen. mvcapp-servlet-context: This file will have information about beans for specific module. Here we have defined common beans that we will need for all modules like datasource which will have information about the DB that we want to connect to. sessionFactory (this too can be moved to module specific configuration file but for sack of brevity I am keeping it here) which will have information about hibernate configuration and classes that will be annoted by @Entity annotation and mapped to one or more tables by @Table annotation. viewResolver: What suffix and prefix will be used to derive view object. Package name that we need to scan for annotated classes for auto wiring beans. Now we write our first controller that will route us to search page. So following will be our controller with single method that will simply move us to search page. We are passing following modules as an element of first argument array of define function. With respect to each module (except last part “dojo/domReady!”) we have respective object (in exact sequence) as function variable which is second argument of function define. i.e. xhr for “dojo/request/xhr”, dom for “dojo/dom” and on for ” dojo/on”. 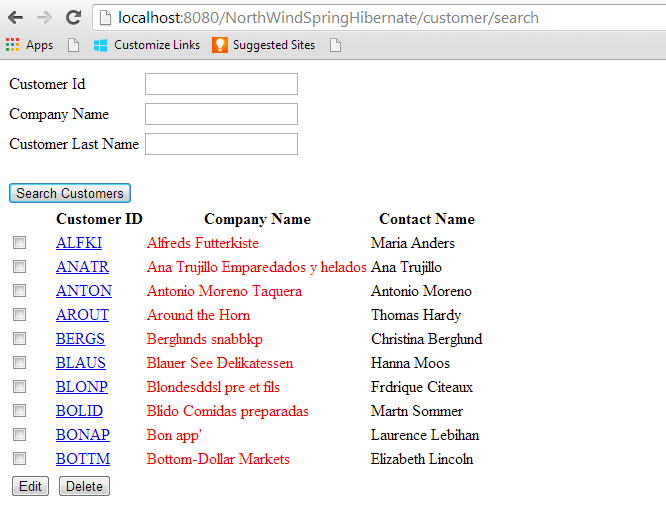 Ø updateCustomer() which will use module dom to get the html form object identified by Id custForm and submit it. Now we will add functions (and appropriate mapping) in controller class to get the listing, show the selected record(s) and update selected customer. So our controller class will have following functions. Interested user can implement Service class and DAO class to list, display and update selected functionalities. Also we will create one jsp for listing search results and one for displaying details screen. Here again we will have new js file that will represent out customerdetails module. When you will select one record and click on Edit button it will take us to next screen to edit the data.